In this gripping second book in the Kingdom on Fire series, Jessica Cluess delivers her signature mix of magic, passion, and teen warriors fighting for survival. Hand to fans of Victoria Aveyard, Sarah J. Maas, and Kiersten White. Still, she must play the role in order to keep herself and Rook, her best friend and childhood love, safe. But can she truly save him? When Henrietta finds a clue to the Ancients’ past that could turn the tide of the war, she persuades Blackwood, the mysterious Earl of Sorrow-Fell, to travel up the coast to seek out new weapons. And Magnus, the brave, reckless flirt who wants to win back her favor, is assigned to their mission. Together, they will face monsters, meet powerful new allies, and discover that some old wounds are still full of poison. 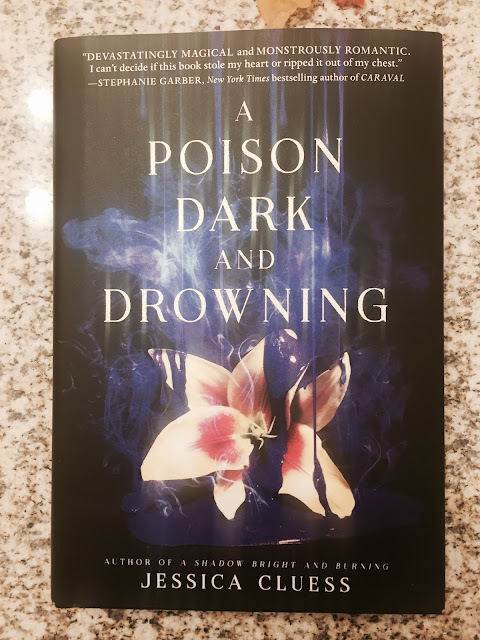 My Thoughts: I love fantasy books (maybe even more than romances, which are a known guilty pleasure for me), so I was super excited to get to read A Poison Dark and Drowning when the publisher sent it to me for review. As always all opinions are my own! I love that Jessica created a little world that works so well in her book, it really brought me into the setting. The characters are divine and the whole thing is a dream to read. I love that it was a longer book too!